Do you find the jargon of finance boring and impenetrable? 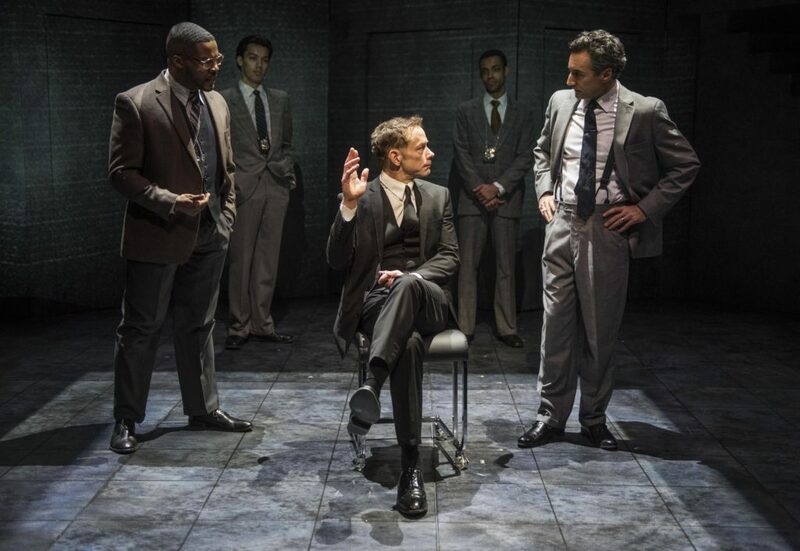 That’s exactly what investment people want—at least, according to Robert Merkin, the dark sorcerer of Wall Street in Ayad Akhtar’s Junk, now playing in a handsome production by Milwaukee Repertory Theater. But even if your eyes glaze over whenever someone tries to explain what “bonds” are, this show is . . . exciting. That’s right: “finance” and “exciting” —two words you’d only expect to find together in a sales pitch. And you can easily imagine Shakespeare’s audiences sitting just as intensely rapt for his history plays, which for them were current events. Junk is no ordinary drama: it’s a creation myth, a saga of how the world we live in was made. And made it was: the loss of American industry to cheap labor abroad; the financialization of the world economy; the excesses of Wall Street, and the mind-boggling concentration of wealth into a few privileged hands, all began (as left-wing economists tell us) in the 1980’s, when New Deal protections were allowed to lapse and deregulation opened the door to (as right-wing economists tell us), the most dynamic, innovative economy in history. Whether you like it or not, the ideas flogged by the likes of Milton Friedman and the Chicago School— that the only purpose of business is to generate profits for shareholders—came of age in this era. The character Merkin is based on the true story of Michael Milken, the “Junk Bond King,” who personified the rapaciousness and greed of the new investor class, who made it their mission to use borrowed money to buy out established family companies and systematically gut them, leaving thousands jobless or without pensions. Politicians on both sides of the aisle embraced them, explicitly or not; they all took their money. It’s hard to imagine a story with more impact on our lives. James Ridge suggests a Lear-like pathos in the beleaguered chief executive faced with losing his family legacy; Jonathan Wainwright brings his patented sneer to the role of a sinister stock fixer; Brian Mani captures the confidence and bluster of an investor who sees that Merkin and company will destroy his world, while Justin Rivera shows the overweening ambition of a minor player whom Merkin, Mephistopheles-like, manipulates by appealing to his avarice. In one scene they sit together in a Los Angeles penthouse, city lights glittering below, speculating on how much money it would take to buy the entire city. Gregory Linington plays the enigmatic Merkin to perfection: is he just an effective snake charmer, or does he believe his own hype about changing the world for the better? Does he really want to help excluded Jews and Latinos take over from the casually racist WASP elite, or is that just part of his chain-yanking patter? The most intriguing relationship is between him and Rachel Sledd as his wife Amy, a financial genius in her own right, who seems to genuinely believe in his transforming mission and supports him in his moments of doubt. The Macbeths come readily to mind, though there’s also a gnome-like trace trace of Shylock in Merkin’s sanctification of the bond, and there’s a touch of Richard III in his single-minded machinations. “Don’t bother with facts,” he tells an adoring crowd. “You’ve got to make people feel.” The powers that be have learned this lesson well. Director Mark Clements keeps the narrative juggernaut grinding forward with the inevitability of Greek tragedy. His decision to run the show without intermission keeps the tension building; the dense, idea-heavy script is a mental workout, but you never find your mind wandering the entire two hours. 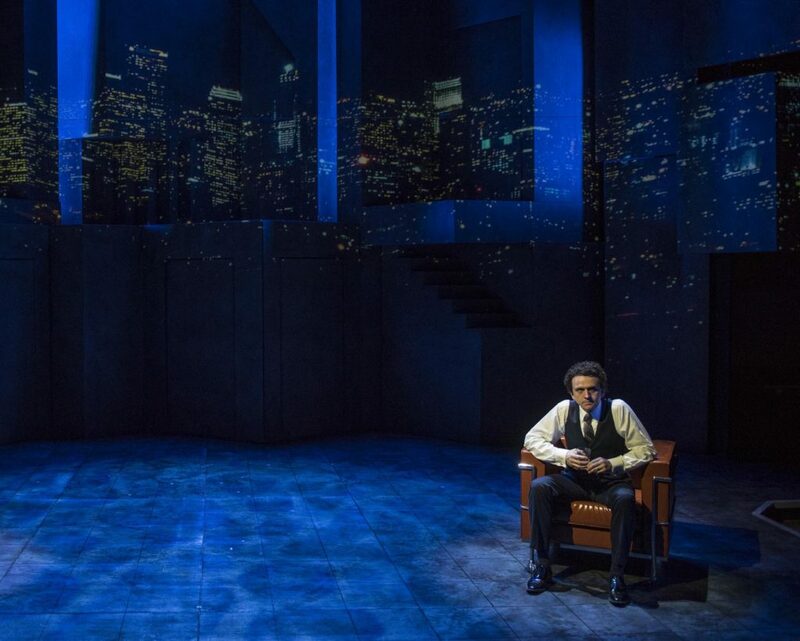 The Rep’s characteristically high production values add welcome elements of spectacle: Todd Edward Ivins’ monumental gray-faceted set could represent office towers, or enormous stacks of virtual wealth, or the Escher-like labyrinths of Merkin’s schemes. Video projections by Jared Mezzochi spectacularly deliver the glamour of business being done at high risk and high stakes, to the effectively chilly drones and pulses of Lindsay Jones’ electronic score. As in life, there is no happy ending. Everyone—from the shareholders, to the company’s employees, to the politician, to the hapless journalist, to Merkin himself—everyone goes for the money in lieu of any ideal, obligation, or purpose. “It was like they were founding a new religion,” the journalist/narrator tells us. But in the end, they all went for the money. It’s a powerful, gut-wrenching conclusion. And it’s the world we live in now.